When upgrading from version 0.5.4.3 to 0.5.4.4 and returning to the network admin site, I had lost all access to the domain management tools. The options normally reside under Settings (right) were no longer there. A quick check of some domains I have setup through domain mapping confirmed that it was still working, ie things were being redirected, however I couldn’t check, change, add or remove any mappings. I couldn’t see them at all. I went into the Network Admin plugins page to find the plugin hadn’t re-enabled itself after the update. As far as I know, this is the first time any plugin has failed to reactivate. If this was by design, a few moments of stress would have been alleviated if some user warning could have been provided. 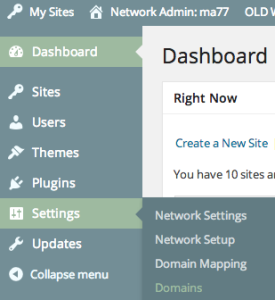 After re-enabling the plugin, all domain maps were right where they should have been.